Keely Hutton is a former educator who published her first novel Soldier Boy in 2017 and her second novel Secret Soldiers in 2019. Keely Hutton is a fairly new novelist who has hit the ground running, taking on a challenge and working with Ricky Richard Anywar to deliver a never before told story about the horrors that have afflicted Uganda. 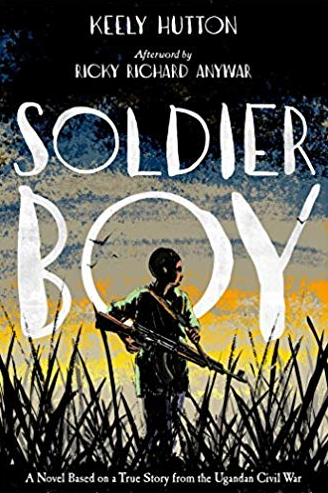 Soldier Boy is based off a true story about Ricky Richard Anywar’s life when he was as a child and forced to be a soldier in The Lord’s Resistance Army (LRA) that was led by Joseph Kony in Northern Uganda. The novel has two protagonists, Ricky who is based off Ricky Richard Anywar, and Samuel who is based off the many children who have suffered under the LRA. Ricky has been abducted with his older brother Patrick and Samuel has escaped the clutches of the LRA. Ricky and Patrick are waiting for their chance to escape and return home, while Samuel tries to reintegrate back into society. Keely Hutton creates a realistic world that constantly juggles between chaos and harmony. Hutton captures the inhumanity of the LRA that has plagued Northern Uganda for years. This novel doesn’t sugar coat the atrocities committed nor try to justify the actions of the criminals. The novel tells the truth and the outcome that has destroyed the lives of innocent people and left its dark mark on Uganda forever.